On a recent visit to Malta, Aboriginal leader and statesman Patrick Dodson reminded his audience that racism does not ‘grow wild in a field’. It is planted and nurtured in ‘window boxes’ close to home. Reflecting on the history of his own country Patrick made a number of telling observations directly relevant today. He outlined how many of the ‘values’ that shaped Australia and many of its laws became genocidal in intent, in application and in consequence. The same ‘moral compass’, he argued, justified the American values and laws that mandated racial segregation in the US before the civil rights movement. It also led to the horrors of Apartheid South Africa and even to the hate crimes of Nazi Germany. He concluded by reminding us that these beliefs and values, systems of laws and regulation shared a common legal, intellectual and moral parentage. And we have just witnessed yet another horrific expression of that parentage in the massacre of innocent Muslims (for no other reason than that they were Muslims) by a young 28-year-old Australian in Christchurch on March 15. It is worth repeating a second time that this event (as with so many similar events elsewhere in the world) inflicted immense pain and suffering on entirely innocent people and their communities simply for who they were. The event represented but one violent outcome of the recent steady descent into making ‘normal’, ‘ordinary’ and ‘acceptable’ daily menus of prejudice, bigotry, hate and, in this case, Islamophobia. One of the most striking and deeply disturbing things about much of public and social media ‘conversation’ around this bigotry and hate speech is that people have become used to it. Comments and myth fuelled ugly assertions that were outrageous, even unimaginable, just a few short years ago have now become ‘shrug-of-the-shoulders’ ordinary. They gain currency and apparent credibility through constant repetition. The more this disease of casual daily prejudice and bigotry becomes commonplace, the more familiar it becomes, the more dangerous it becomes and the more potentially lethal it becomes. Through repetition the more deadened we become to their implications and their impact. Words generate feelings, feelings responses and responses actions, many of them abusive and lethal. When the conversation becomes divorced from common sense and when it is imbued with nastiness, a sense of outrage at perceived threats or devious plans, we get a toxic mix, one that can spill over into violence at many levels. When we collude in or refuse to challenge this daily bigotry, we tacitly accept it and become implicated. The effective failure of almost all social media to address the disease of hatred, racism and Islamophobia simply fuels the agenda and facilitates its manipulation with potentially catastrophic consequences as we have just witnessed. Given the amount of time many of us spend online and given the power and deviousness of the algorithms that manipulate our ‘online literacy’ and our thoughts, emotions and mind sets, there is reason to be deeply troubled. We need to hear the multiple alarm bells. We may inoculate ourselves from what has and is happening by telling ourselves “it won’t (couldn’t) happen here”, he (Brenton Tarrant) was just one deranged individual. But his 74-page manifesto says otherwise; it constantly refers to a ‘Great Replacement’, the ideology routinely encountered even here in Malta which insists that the white, Christian population is under threat from a deliberate plan to supplant it through Muslim immigration. The manifesto echoes the same ideas of Klu Klux Klansmen in Virginia in 2017 (whom Donald Trump defended) who chanted ‘White lives matter’ and ‘Jews will not replace us’. It echoed also the views of Robert Bowers who described Muslims as ‘invaders’ (how often we hear of ‘invasion’ here in the Mediterranean) as he shot 11 Jews at a synagogue in Pittsburgh in October 2018 because they were voluntarily active in resettling refugees, many of them Muslims. The manifesto refers to many other individuals and events for example in the US, UK and Norway. We are also witnessing the normalisation of this public conversation in the messages offered by Hungarian Prime Minister Viktor Orbán who likes to present himself as a ‘defender’ of a Christian Europe under threat from Muslim immigration. Likewise, Italian politician Matteo Salvini who seeks power by arguing, among other things, that Italians should be careful not to end up like Britain where (he imagines) Islamic courts have displaced British courts. Trump must also be featured in this process of normalising ugliness and bigo-try. Echoes are also to be found at the extremes of the Brexit debate. There is much evidence of Patrick’s warning about window boxes close to home. In the West’s enthusiasm for the ‘War on Terror’, Islam and Muslims have routinely been treated as public enemies and hate speech against them has been normalised. In Australia, too many high -profile politicians, dominant news corporations and even arms of government have depicted Muslims as a source of public danger. 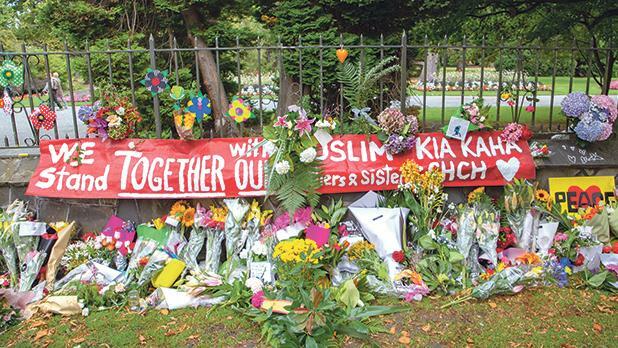 When we reflect on what happened in Christchurch, we need to simultaneously reflect on what Brenton Tarrant heard, saw and read as he grew up in Australia. As we share the revulsion and the condemnations of events in Christchurch and as we express solidarity with those families and faiths that are suffering, we need also to undertake an examination of conscience as to whether we might somehow be tending window boxes. Colm Regan is a human rights teacher and activist.